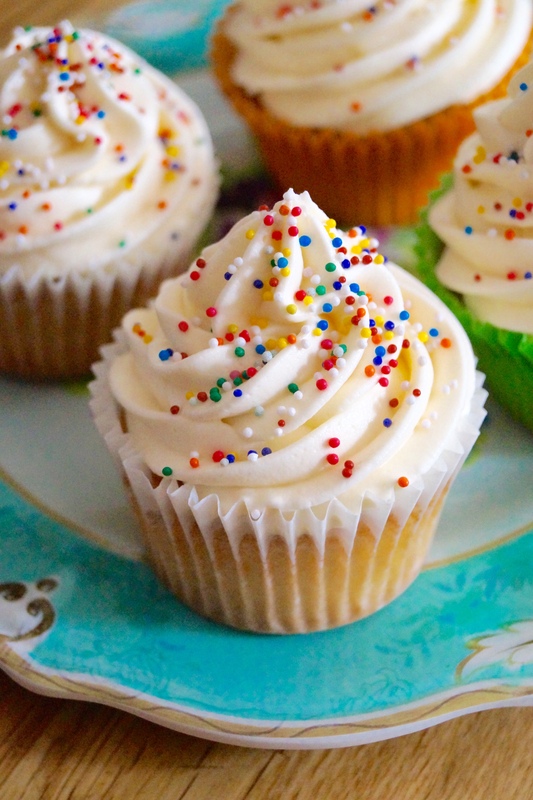 Light and fluffy vanilla cupcakes topped with a lush vanilla buttercream and sprinkles! The perfect bake for any occasion and a great recipe for anyone new to baking! 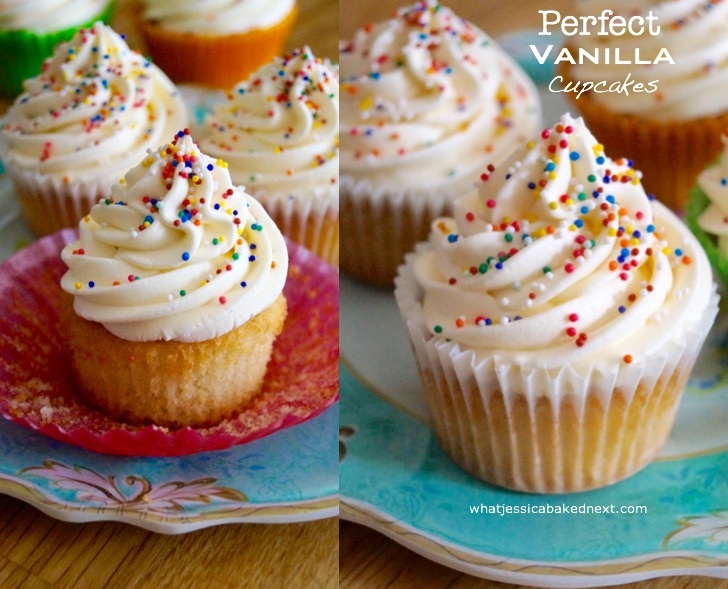 It’s about time to share my favourite and fail-proof vanilla cupcake recipe on the blog! And when I say perfect I mean these are the BEST vanilla cupcakes I have ever made! I baked some delicious vanilla cupcakes to ready celebrate my birthday later this weekend! I turn 19 this Sunday and it wouldn’t be a celebration without cake or sprinkles involved, right?! Vanilla cupcakes have always been one of my favourite bakes and this is a recipe adapted from childhood and it’s one I have been making with my mum since I first stepped into the kitchen. These are seriously fluffy and with a beautiful vanilla flavour. They’re not sickly sweet and have just the right balance of flavour, sweetness and deliciousness. If you’re a regular reader, then you will know how popular the simple and easy recipes are on this blog! I love my no-bake recipes or no-churn ice creams and now quick and easy cupcake recipes too! When you’re baking cakes or cupcakes you need to remember some important points for a successful bake. Below I’ve put together my top tips. 1. Always cream the butter and sugar for at least 5 minutes. You want the mixture to be really pale and airy with no big lumps of hard butter. I usually leave the butter out at room temperature overnight to soften. But I am also guilty of softening it in the microwave too! 2. Always bake with room temperature eggs. I experienced many baking fails before finally perfecting these cupcakes. Room temperature eggs will give your cupcakes a finer crumb and they will bake more evenly and quickly. To warm your eggs before baking, place the eggs in a bowl or glass of warm tap water for 5-10 minutes. This is a life-saving baking tip and it’ll save you a lot of frustration! 3. 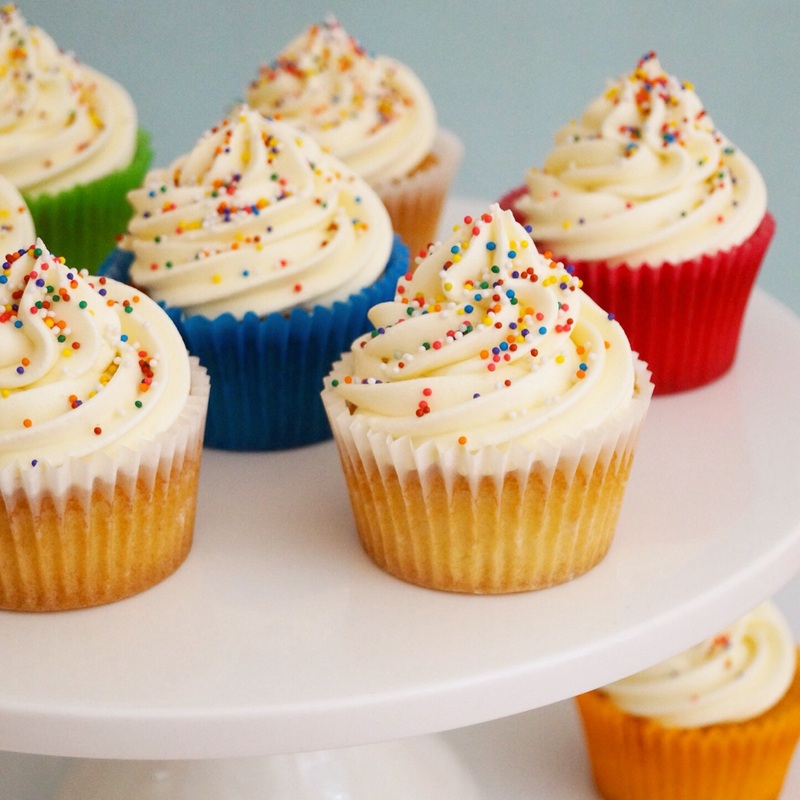 Remember to sift your flour – to avoid lumps of flour in your cupcake batter. 4. Always fold your dry ingredients into the batter. I love to use a rubber spatula to fold in the flour into this cupcake batter, this will stop you knocking any air out of the batter. 5. Test the doneness with a cake tester, this is the most precise way to check the cupcakes are completely cooked through. When the cake tester is inserted into the centre of the cupcake it should come out with no uncooked batter. This way you can guarantee they’re cooked fully! I recently baked this vanilla cupcake recipe again and decorated the cupcakes with Cake Angels Blush sprinkles and individually hand-crafted Pastel Hydrangea – Flower Power royal icing sugar decorations. Both the sprinkles and royal icing sugar decorations make these cupcakes extra special! 1. Preheat oven to 180°C / 160 degrees Fan / 350°F / Gas Mark 4. Line a cupcake tin with 12 cupcake cases and set aside. 2. 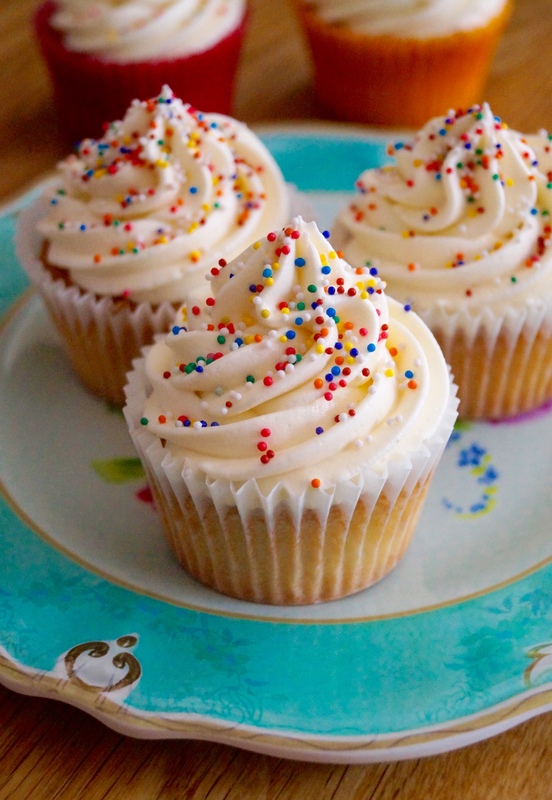 To make the cupcakes: Beat the softened butter with the sugar until fluffy and smooth. Add the eggs one by one along with the vanilla and mix until incorporated – at this point the batter will look like it’s curdled, however once you’ve added the flour it will come together. 3. Now fold through the flour and mix until no lumps of flour remain. Add enough milk to loosen the mixture slightly – approx. 3-4 tablespoons of milk will do. 4. Evenly divide the cupcake batter between the cupcake cases. 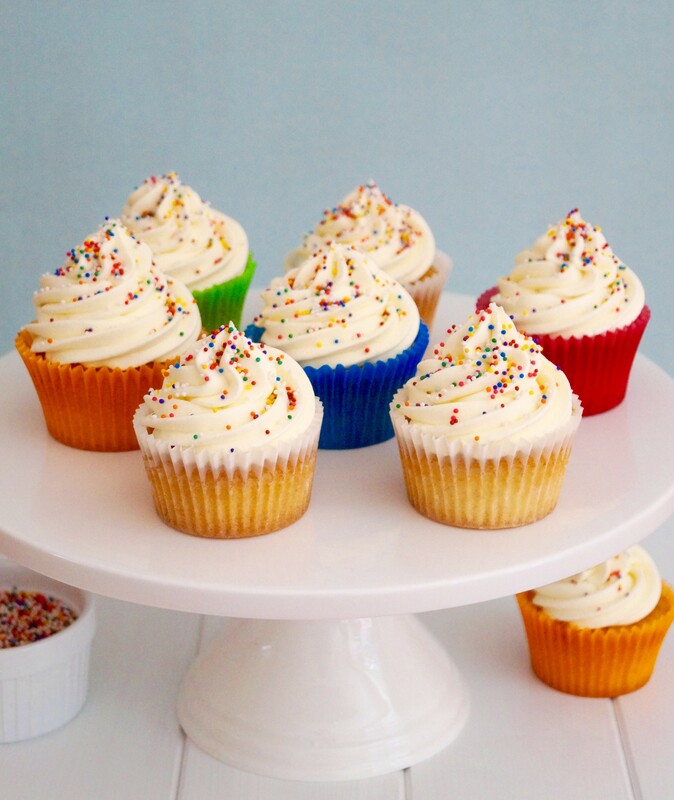 Bake the cupcakes for 15-20 minutes or until a cake tester comes out clean without any uncooked batter remaining. Leave the baked cupcakes to cool in the tin for a 5-10 minutes, then carefully remove the cupcakes from the tin and transport to a wire rack and allow the cupcakes to cool completely to room temperature. 5. To make the buttercream: Once the cupcakes are fully cooled make the buttercream. Cream the softened butter for a minute or two to soften. Add the sifted icing sugar and the vanilla extract and beat gently together until the butter and sugar has combined. Now continuing creaming for another 2-3 minutes until the buttercream is a light pale colour. Now add the double cream or milk and beat until combined fully. 6. To decorate the cupcakes: Fit a large disposable piping bag with your favourite nozzle. Fill the piping bag with the frosting, pipe even swirls on the top of each cupcake, then finish decorating with sprinkles. If you don’t want to pipe the buttercream onto the cupcakes, you can spread the buttercream onto each cupcake using a small palette knife. Baking time will depend on your oven. This recipe recommends 18-20 minutes, but different ovens may cause the baking time to differ slightly. This cupcake recipe can easily be doubled or tripled to make more. For the frosting I like to add a few tablespoons of double (heavy) cream. The cream makes the frosting lighter and it will have a creamier texture. If preferred, you can substitute with milk, but please note that frosting will not have a such a creamy texture. The frosted cupcakes will keep in an airtight container for up to 3 days. With the frosting you can add a few drops of your favourite food colouring. Add a touch of red for a pink colour or blue!